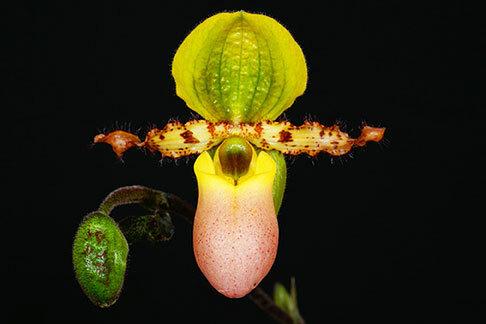 From the famous Bear Nursery in Taiwan, this charming little species is the result of Mr. Bear selfing his very best clone of Paph. primulinum var. purpurascens ! A small grower and successive bloomer, it can continue to produce buds and flowers on the same spike for months, one flower after another. This selfing is a very vigorous grower and will readily produce multiple spikes on multiple new growths when fully mature. Very Highly Recommended !